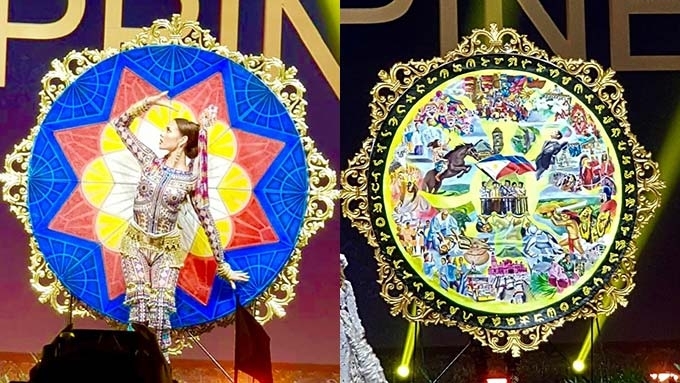 Ikinalungkot ni Miss Universe Philippines Catriona Gray ang hindi pag-ilaw ng giant parol na ginamit niya sa national costume show ng 67th Miss Universe, na ginanap sa Nong Nooch International Convention and Exhibition Center sa Pattaya, Thailand, kagabi, December 10. Ipinaliwanag ni Catriona na nagkaroon ng technical mishap kaya hindi umilaw ang parol na fiber glass ang materyal at gawa sa Pampanga. “On the day itself and on the time that I walked out of stage, yung ilaw ko or the lights, they weren’t working and I am really really sad about it,” ang sabi ni Catriona. “The parol itself is really heavy. I was initially supposed to carry it but the weight was just too heavy and it was on my shoulders so we just had to put it on wheels. “The wheels that we prepared for is for the flat floor, tiled or wooden floor, just a smooth floor and I didn’t expect that the floor for the national costume competition would be carpet so when I walked on the carpet, the wheels were not running smoothly and it’s really hard to pull. “That is why it's difficult to pull my costume, but you know that I just wanted to show the Filipino artistry,” ang kuwento ni Catriona tungkol sa karanasan niya sa national costume show ng Miss Universe 2018.